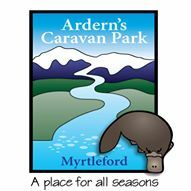 Ardern’s Caravan Park is a family friendly park situated in the Ovens Valley approximately 600 metres from the Myrtleford Post Office. It is adjacent to the Murray to the Mountains Rail Trail and backs on to the Happy Valley Creek. Ardern’s Caravan Park is an ideal spot for you to discover this amazing area with it’s stunning scenery and a host of tourist attractions. Please call 03 5752 1394 for bookings.